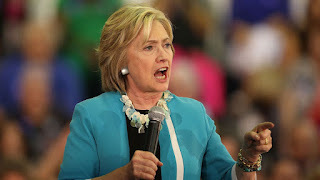 Bob Woodward was on Morning Joe today talking about Hillary Clinton, and in the course of the conversation he said, "I think a lot of it with Hillary Clinton has to do with style and delivery, oddly enough,. She shouts. There is something unrelaxed about the way she is communicating." So then the convo moved to Hillary's trust issue and how she really didn't win much in Iowa because the young kids don't go for her. But Woodward, ever the Pulitzer Prize winning investigative reporter, brought it all back by saying, "I'm sorry to dwell on the tone issue, but there's something here where Hillary Clinton suggests she's almost not comfortable with herself. And, you know, self acceptance is something you communicate on television." Well! I put on my blogging frock and tilted my dainty little fingers over my lovely, shiny keyboard (No more cookie crumbs! I cleaned it yesterday.) and began looking for the words that would singe the damn paint off of my stylishly hued walls. I was mad! So there I was, fingers poised, at the ready, when a radical thought entered my almost-perfect-if-not-for-the-bed-head: I've never cared about anything Bob Woodward has said before. Why the hell should I care now? And Scarborough? Same thing, only stronger. We're going to have months of this--her tone, her voice, her pantsuits, her hair, her age, her attempts at seeming human--so we need to decide early on whether it's worth it to waste time on silly distractions. Who really cares? She's a woman; I'm a woman. Hillary has done things and now she's running for President of the United States. There the similarity ends, so if I'm going to support her for the presidency I have to stop wasting time defending her womanhood and start defending her ability to do the job. So I will not care who insults her personally any more. She has bigger fish to fry. Hillary has known this for a long time. I'm just now getting it. I'm in awe of how much I'm learning from her.